If you want to post events to the gotfolk calendar, please send an email to gotfolkadmin a t gotfolk.com. See below for more details. We will send you a username and password which will allow you to post events. Important!! To Place an event on the calendar, click Add Event if it appears at the top of the page, not the +new link. If you are in the dashboard, go to Add Event in My Calendar, not the Posts section!! You can post your own events to the gotfolk calendar. Folk music or folk music community related. After receiving your email, you will have your user created, and a username and password will be emailed to you. Your first few events will be subject to admin approval, after which, your events will automatically appear.. Entering time is in the format hh:mm using 24 hour military time. When learning how to post, enter your first event piecemeal i.e. enter the title and very short description first and save, enter the full description and save, time and save etc.. This will make it easier for you to see what works, and what doesn’t work. Clicking on the ID column in the Manage Events section will move the post you are working on to the top or bottom of the list, making it easier to find. Make sure you enter the location area of Florida where the event is taking place in BOTH the category and location fields!!! To add an event, you have to go to what wordpress calls your dashboard. There should be a link to it at the top of your browser screen under your user name . In dashboard, you will see Mycalendar on the lower left. Clicking on mycalendar will give you add/edit events. The event title will appear on the gotfolk main page upcoming events on the right and on the full calendar itself. The advanced description will appear when you click on the event in the main calendar. The host field is not used now, but you should leave your user name there. In category, use the county of the event. ** CATEGORY IS A CRITICAL FIELD ** If it is blank, your event may not show in the calendar. Location will be county or online for michael’s show. etc..
New users first few events require approval, then approval will no longer be required. If you have difficulty with an event, please let me know.. Right now the categories are county. We may use this to allow users to click on county and see just their county events.. 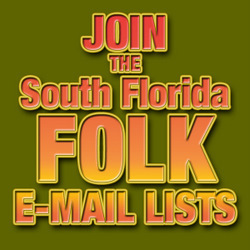 If gotfolk calendar goes state wide, we may change to south/central/northern florida as counties..